Welcome to the Rotary Club of Formby Squirrels website. Please also see our Facebook page: Rotary Club of Formby Squirrels which has photos and details of our activities. Come along to a meeting at the Community Firestation in Formby and see and hear what Rotary is about. We think you will be surprised. Formby Squirrels Rotary Club operates flexibly, is happy to embrace innovation and is truly mixed in membership. The club meets twice a month and does not routinely have meals as an integral part of the meeting. The business meeting is on the second Thursday of each month at the Community Room Formby Fire Station, Church Road, Formby Liverpool L37 3NH and a further social evening is held on the fourth Thursday which can be bowling or boules on the beach, a walk, a meal or just a drink. Formby Squirrels enjoy FUNdraising with a focus on local charities. 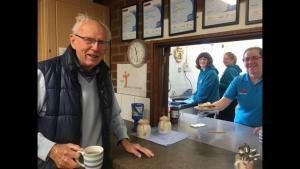 Squirrels also regularly support "butty bars" held at Formby Holy Trinity Workshop on Saturday mornings where local residents get together over coffee or tea to enjoy the bacon butties or rolls and toasted tea cakes that the Squirrels have prepared for them. A raffle, bric-a-brac table, book sales and home made cakes help with fundraising but the primary purpose for the Squirrels is the community and social aspects of meeting and chatting to the locals. The repartee in the kitchen is also a fun part of the morning. Please come along and join us whether Rotary or not. The butty bar runs every Saturday.